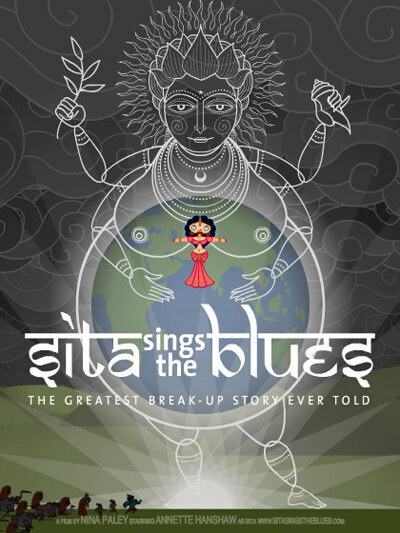 Coilhouse » Blog Archive » Sing Those Blues, Sita! It didn’t even feel like a choice: it was the inspiration for the whole thing. I was going through my break-up, I was reading all these different versions of the Ramayana and I heard Annette Hanshaw’s songs for the first time. They just went to the same place, they spoke to the same part of me. I realized that they were telling the same story. At its heart, what do you think that story is? [Laughing] That life is difficult and that, yeah, they tell a story of love and heartbreak. During the course of the movie there are three shadow puppets that add some pretty tongue in cheek modern insights into the story, who were they and why did you decide to do that? They were Aseem Chhabra, Bhavana Nagulapally and Manish Acharya and they were just friends of mine. That recording was an experiment. I made the film sort of in the dark — or I made it on faith. I didn’t know how everything was going to fit together exactly when I started. 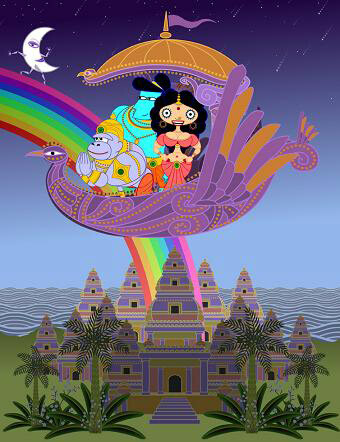 I thought I would get my friends, some friends, into the recording studio and ask them questions about the Ramayana. It was all unscripted and we didn’t know how it was going to be used. I expected to have to interview a lot more people. But no, the first try just worked great. I understand the movie’s facing some difficulties in India? Yeah, difficulties – no one’s had the balls to screen it in India yet. Because there is a sort of nationalist, fundamentalist movement in India that’s very hostile to any sort of art dealing with Hindu themes that is not approved by them. It’s a totally authentic ending: it’s the last book of the Ramayana. The story either has that ending or they cut it off before that chapter. But it’s not like that chapter is ever told with a happy ending for Sita, or very rarely. People know that’s what happens. Even the Amar Chitra Katha comic book version has that ending. And closer to home, the movie’s facing some difficulties with some copyright issues? It is, but everybody faces issues with the existing copyright system. It’s pretty brutal. It’s about the songs themselves. All the research I did was on the recordings, which are not covered by federal copyright law, which is great. However, the compositions that underlie the recordings are not only controlled, they’re controlled by these corporations that have no regulation on what they can charge. For me to get permission from them to use these 80-year old songs would have cost me more money than it cost to make the entire film. The songs were supposed to be in the public domain in the ’80s, but everything’s been extended by big media corporations for various reason. It poses quite a challenge to tiny little low-budget artists like me. What they’re asking for is a really a drop in the bucket for a big studio or a big production. But it’s completely untenable for me, being poor. So we’re working on it [Laughs]. You went ahead with the movie anyway. Oh heck yeah! I didn’t actually realize the compositions underlying the songs would be the problem. But even if I had, I would done it anyway, because the alternative would have been to not make the movie — and that would have been wrong. The fact is that I’m not rich and there’s no way I could have gotten the amount of money these people want. I don’t think it’s right to kill a good idea over that. It would have basically just functioned as censorship. The only thing that would have happened is that I would never have made the movie. That would have been horrible. There’s actually a lot of art that’s never been made because people are so scared about this stuff. As I was making this movie I thought “if I end up just giving this away for free, thats’ o.k. because I need to make this movie. What I found out much to my horror is that legally, I can’t give this away for free. That was really disturbing. Wait: you can’t give this away for free? Copyright laws are such that they’re not based on making money, they’re based on distributing it, which I can’t do until I pay for these rights. [Laughs] That’s one of the many things that’s turned me into a free culture activist. So you’ve taken the movie on the road. It’s gone to Berlin, it’s gone to Tribeca, it’s gone to all these film festivals around the world. How has that gone? A big surprise. It’s something I’ve had very little control over. I’m not exactly sure how it happens, all I can say is that I’m very, very lucky or the film is very, very lucky because it’s going around on its own. I’m realizing that I’m also really lucky it hasn’t been picked up by a distributor, because a distributor generally doesn’t want it being seen at festivals once they’ve picked it up. Films will go to a festival, they’ll get picked up by a distributor and they’ll be very, very hard to see until the commercial release. Yeah, the distributor will want thousands of dollars to play it anywhere. Right. I don’t really know what the rationale behind that is. Maybe they think only certain people will be interested in a film and that if they play it at festivals they’re going to saturate the market or something. I don’t really think that’s true. But, for whatever reason it’s been this blessing I haven’t been picked up by a distributor, because any festival that asks for it, I can say “sure!” I just want people to see this film. So what’s next with Sita? I’ll be able to answer that question in a few days or weeks. I’m just going to a meeting today about that. But I’m ridiculously optimistic about the future. It will probably have nothing to do with any sort of commercial distributor, but I can tell you more later. On your site you have a button for donations, what are those going for? They’re going to me. [Laughs] Like when I had to make a 35mm print to get the film shown at Berlin, I just put the word out, asking for help and people donated. Now, when people donate, those are people that get review copies [of the film], but again, that’s not selling it. It’s very, very important everyone knows: [raising voice] I’m not selling DVDs. [Laughs] A lot of people also donated while it was a work in progress. I really see this glimmer of it as an audience-funded movie, because the people that have been donating are viewers. I didn’t plan it this way and the amount of donations I got were not that huge a portion of the money it took to make the film, but it wasn’t insignificant and it gave me this glimpse that audiences could actually finance films through the internet and there are other filmmakers that are doing it this way. I had all these clips of the work in progress online and it blew my mind, people just sent me donations big and small. They made a difference and gave me this vision of what audiences can do. What’s your next project after Sita? I’d like for my next project to have something to do with freedom of speech, seeing as I’ve been legally prohibited from distributing my film until I cough up some money. I’m thinking about free culture, free software, free speech. It will probably be a short film. I don’t think I want to make another feature quite yet, though it’s not to say I won’t make another. How long did it take to make this one? It took three years of work over five years of time, from the first doodle until the feature film. Yeah, on my laptop at first. [Laughs] I upgraded to a tower later, then another when I had to do full rendering. It took so much time that computing technology had gotten more powerful. What’s making me so optimistic right now is what audiences can do and what they are doing. Historically audience participation is measured in money: they buy tickets and that’s it. It doesn’t have to be like that at all. I’ve been so helped and supported by my audience. It’s completely voluntary. There’s some people that watch it and don’t like it, there’s some people that love it. There’s some people that donate and some that send me words of support. I actually think audiences can distribute films. They call that piracy right now, but I think that might be off. In fact, I know that’s off. It’s very cool to have this new technology that not only allowed me to make the film, but is allowing filmmakers to connect with audiences in new ways. This film looks amazing, I must see it. The fact that doing so is difficult due to copyright related baggage is very disheartening. Oh, I want to see that, too. It looks fantastic. I’d seen clips of this in progress a couple of years ago — I’m so excited that it’s finally finished! Really good article/interview. Sounds like my kinda film. Still peeved I had to miss the Asheville showing. And that last answer is dead on. This looks very interesting. Though is it sad that I’m only familiar with the story because of A Little Princess? The film looks riotously funny, though! Here’s to hoping that Nina Paley can work through all this copyright nonsense and we can see the whole thing! Dear Lord, I must see this move! Any idea if it’s coming back to the Washington, DC area anytime soon? Please, Nina, show it here again! 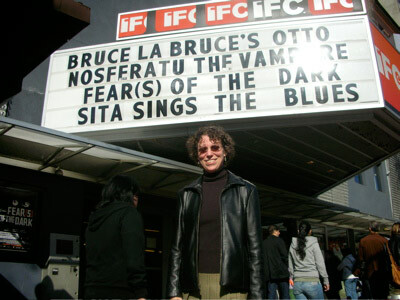 Saw this film when it was in Vancouver. It’s as good as it looks. Those three shadow puppets are huge highlight. See it when you can! Ah, good old, saintly Sita. My only question: Did they include the part at the end where she leaps onto the funeral pyre? They mentioned the ending is a bit different, but still, I’d be curious to see how that’s dealt with. Don’t despair, everyone. While it’s regrettable that the copyright issues have kept such an amazing movie from being seen by a wider audience, it is still making its way around the festival circuit (thanks for the link, athingcalledcat!). In addition, there are some review copies available, and I’d contact Paley (who’s really responsive and nice, btw) if y’all are interested in getting one of those or, if you’ve seen the movie and loved it, donating to the cause. Jerem: Midnight movie showing in Asheville? If enough people are up for it I’ll see what I can do. Erin: Nah. A lot of things in life work like that. I started reading George Orwell back when I was a kid because he was quoted in a Marvel comic. 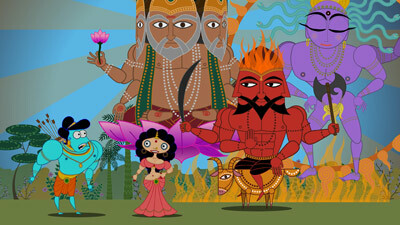 One of many things that pleases me about Sita is that many people who saw it in Asheville have been reading up on the Ramayana and other Hindu mythology. Alice: Yup, there are Hindu fundamentalists galore out there and you’re right, no group (religious, nationalist, etc.) is exempt from that mindset. In my experience it’s a personality type and functions very similarly no matter what particular dogma they’re filling their blanks with. 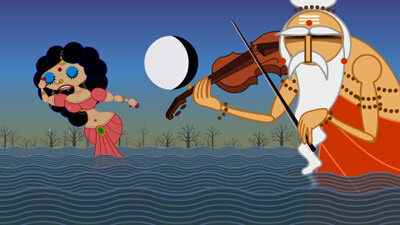 Io: Well, not to give too much away, but there’s a very pointed “Rama set his wife ablaze” sing-along. I think you’ll like the movie’s take on the whole story. the stills look fab! I wanna see it too! I can imagine that there’s someone out there making a film that is funded by his audience, with ideas by them and then distributed by them; a sort of community film made possible by the community spirit of the Internet.